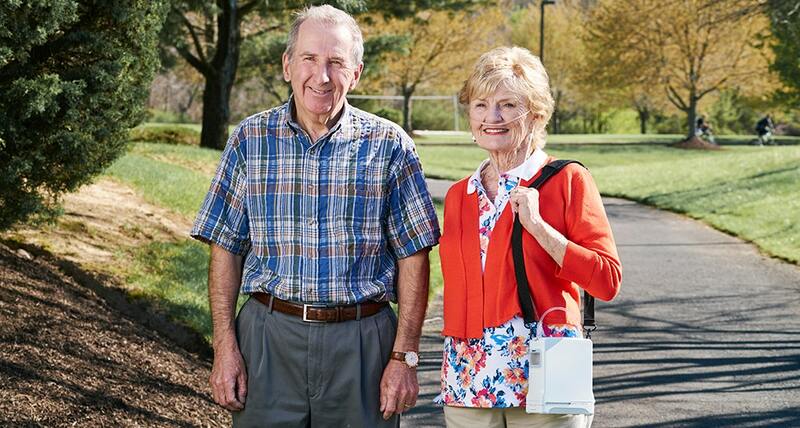 If you are in need of a portable oxygen concentrator but not sure where to start, this guide will cover everything you need to know from how they work, to varying features, and even delve into the different brands on the market today. Air that is inhaled from the atmosphere is approximately 78% nitrogen, 21% oxygen and 1% other gases. An oxygen concentrator separates the nitrogen from the oxygen, allowing for the user to breathe in over 95% pure oxygen for therapy purposes. The device does this by absorbing air through the inlet filter and compressing it into one of two "zeolite towers." The first zeolite tower consists of two cylinders with sieve beds, which become saturated by the nitrogen from the air. At this stage, a valve opens and oxygen is forced into a second zeolite tower. Excess nitrogen is then removed and any remaining nitrogen in the sieve bed is released through the ventilation system. This then leaves a purer state of oxygen to be inhaled. There are two primary types of oxygen units, the Pulse dose unit, and continuous flow unit. A pulse dose machine delivers air to the patient in the form of short puffs. It senses when the patient is ready to take a breath, releasing the oxygen in stages as to not waste any. These units are triggered by nasal inhalations and therefore may not be as effective when the patient is asleep. The continuous flow unit produces a steady stream of oxygen. The compressors tend to be larger for this reason, and there is the possibility of oxygen waste due to the patient not breathing in constantly. These units do not expel more than 3 liters per minute due to maintaining a balance between battery size and portability. The settings on a continuous oxygen machine allow for the user to input how many liters they want to inhale per minute, whereas a pulse machine uses a particular setting mode that is not related to liters, but to the quantity of puffs. The type of unit you’ll require will most often be prescribed by your health care provider. Once you know the type of device you need, here are the key features to consider when comparing portable oxygen concentrators. Battery life is affected by how much the device is used and the setting it’s on. If the device is in use while traveling, a larger battery may be more appropriate, however, this tends to be heavier and less convenient. If there is an electronic outlet within a vehicle, this may be more appropriate for more mobile patients. It is always recommended to have a spare battery at all times, and when traveling via airplane, according to regulations, the battery must be able to last twice the length of flying time. The bigger the oxygen machine is the more output capacity it has. However, this does not mean larger units are the most convenient, especially if the user likes to travel. It is essential patients test a concentrator before committing to one. Size will be an important consideration for those on-the-go. You’ll want to look at the range of options available to see what is best for your needs and lifestyle. Being that these devices will have to go everywhere with you, you might want them to be as small as possible, or you may need one that is more powerful. Be sure to compare the dimensions and oxygen output of each device and consider how you will transport it. The weight of a portable oxygen device will vary. Some units can be carried on a patient's back, while others can be wheeled along the ground. A continuous portable device weighs approximately 17 to 20 pounds whereas a pulse flow portable alternative can be anywhere from 3 to 10 pounds. You will want to compare options to see which is most manageable for your day to day life. Given that the average quiet home has a decibel unit of 40 dBA, an oxygen concentrator will typically be between 37 and 43dBA. This sounds like a very low hum, much like a refrigerator or the inside of a library. 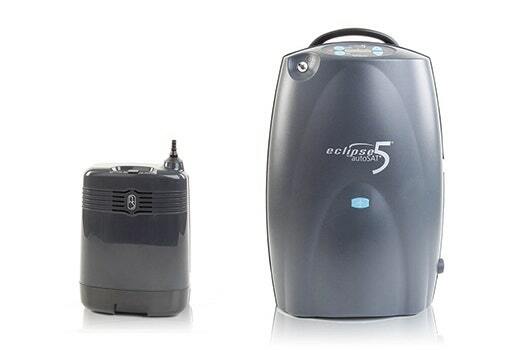 Portable concentrators tend to be quieter than home-based devices primarily due to the difference in size. It can also depend on the setting of the device that is being used. Check the dBA of the units you are considering to see how loud its operation will be. An FAA approved device will be one of the safest and most reliable options when purchasing an oxygen concentrator. This is an important consideration if you plan on traveling via airplane, as airlines require FAA approved machines in order for patients to fly with them. To ensure that the oxygen concentrator is effective and reliable, it will have a warranty, ensuring it can be replaced or repaired by the manufacturer if there is ever an issue. The warranty will typically be 3 years although most devices have a lifespan that far exceeds this. If there is a cheaper model available without a warranty, then this adds a risk of incurring future costs of replacing the device should it break. The Respironics range boasts excellent battery life across the board. The Respironics EverGo pulse machine has 6 settings at 0.5 increments. It's lightweight at only 8.5lbs and has an operational altitude of 8000 feet. In comparison, the Respironics SimplyGo has both continuous and pulse dose mode. This model has a weight of only 10 pounds and 4.6 hours of portability. This has a continuous flow of 2 LPM. The SeQual Eclipse 5 mobile unit is one of the most energy-efficient models on the market. While it is slightly heavier than other portable brands at 18lbs, it comes with a cart that can be used to wheel it around. Alternately it can be carried in a backpack. It is durable and able to withstand high altitudes. The battery lasts 4.4 hours on the highest setting and has a pulse dose of 1-6 LPM. There are two pulse-dose models to choose from in the Inogen range. The Inogen One G3 and G2. Both of these devices of the quietest available, have a 4-hour battery life and have the same operational altitude of 10,000 feet. The G2 can go from 1 – 5 LPM, which is higher than the G3 that can only go from 1-4 LPM. The batteries are rechargeable and take between 2 and 8 hours to recharge depending on the battery type. The Invacare Solo is a quiet model which is both continuous and pulse dose. It weighs 17 lbs and comes with its own carry cart, but can also be worn in a backpack. It has a pulse dose range of 1- 5 LPM and a continuous range of 1 – 3 LPM. This model has one of the highest oxygen purity levels that exceed 95%. Another Invacare model is the pulse only XP02. This stylish model only weighs 7.3 lbs and a range of 1-5 LPM. It also has a large control panel for easy use. There are 3 pulse-dose air step models. The first two are the Freestyle 3 and the Freestyle 5. The Freestyle only weighs 5 lbs and is very small, whereas the Freestyle 5 is 7 lbs. They deliver a pulse dose of 3 LPM and 5 LPM and are very portable. The third model is the Airsep Focus. This device is also very small, with a weight of only 2 lbs and a pulse dose rate of 2 LPM. InovaLabs is a continuous and pulse dose concentrator. It has a battery life of 3 hours and weighs less than 5 lbs. It has a pulse dose of 3 LPM and can be worn in a backpack or carry bag. It also has an operational altitude of 10,000 ft, making it perfect for traveling. The DeVilbiss IGo is suitable for people who require a higher pulse dose. It weighs 19 lbs due to its ability to produce a larger continuous and pulse dose of 3 and 6 LPM. Due to its weight, it comes with a carrier cart to assist in transportation. The Oxlife Independence is great for traveling due to its operational altitude of 13,123 feet. It comes with wheels and a cart handle for easier transportation and a pulse dose setting of 1 – 6 LPM in 0.5 increments. It also has a continuous setting of 1 – 3 LPM in 0.5 increments. It has a 4-hour battery life on the pulse dose setting and 1.5-hour battery life on the continuous setting. Nasal Cannula: This accessory assists with the oxygen being easily transported from the machine to the user through tubing that fits into the nose. Oxygen Masks: An oxygen mask is ideal for a patient who have higher oxygen needs for maximum airflow. Replacement Batteries: It is always a good idea to have a backup battery just in case something unexpected occurs. When it comes to traveling by plane, each airline has different guidelines that they adhere to regarding portable oxygen concentrators and their batteries. It is always advised to check with airlines before booking a flight. In addition to an FAA-approved device, the majority ask for the battery to last several hours longer the length of the flight, as well as requesting that spare batteries be carried by the passenger. This means that long haul, international journeys may ask for a large quantity of batteries to be brought on board. Carrying Cases and Carts: This is useful for both portable devices and ambulatory oxygen tanks. The machines can be transported via carts and carry cases, or worn in a backpack for convenience when traveling. Simply put, this means paying the full cost of the machine up front before it is delivered. The device is then owned outright by the patient. Bill me later is a credit service where the purchase does not need to be paid for immediately. This process tends to be much easier than obtaining a credit card or loan and means that payments can be made in monthly installments to suit the patient. 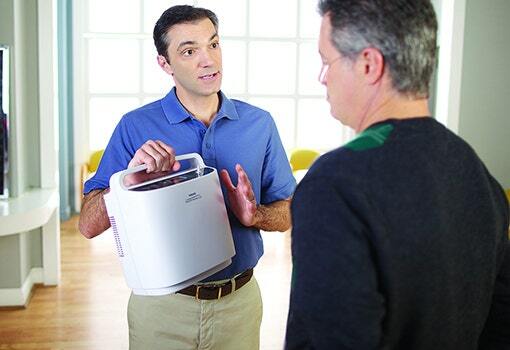 A discussion should be had between the patient and their healthcare provider to decide on which type of portable oxygen concentrator is required (continuous or pulse dose). After the ideal dosage is prescribed, a unit can be narrowed down to fit the individual needs of the patient taking the above points into consideration. View more on selecting a portable concentrator.